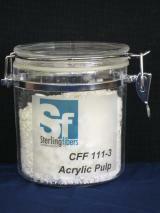 CFF® acrylic pulp offers a number of unique advantages in specialty wet laid and slurry applications. CFF fibrillated fiber was developed to serve as a high-efficiency binder in addition to providing other engineering attributes to papers, speaker cones, filter media, nonwovens, pulp molded products and specialty composites. CFF fibrillated fiber pulp is produced by unique Sterling Fibers technology incorporating a special grade wet spun acrylic fiber precursor, and is fibrillated in a customized refining process. The architecture of the pulp, which is obtained by controlling the combinations of fiber length and degree of fibrillation, distinguishes CFF as a uniquely engineered fiber.